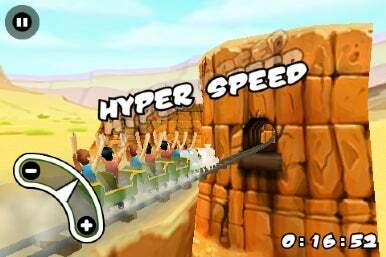 Another batch of games for you to play on your iPhone and iPod touch includes Digital Chocolate’s 3D Rollercoaster Rush, FaceFighter, which lets you punch out friends and foes alike, plus lots more. In 3D Rollercoaster Rush, you control the velocity of rollercoasters for maximum fun. Digital Chocolate’s newest game is the $5 3D Rollercoaster Rush, a game in which you can play 40 different rollercoaster tracks, overcoming loop-the-loops, big jumps, tunnels and more to upgrade the number of cars on your rollercoaster. There’s a Career Mode and Challenge Race mode. It’s similar to the “2D” version of Rollercoaster Rush, but with more … well, D.
In Spinapse’s PixPop, you touch art of the big picture, then touch the matching token on the right. If you’re correct, then the token pops and disappears. And when you pop all the tokens, you get a new picture. The game features a worldwide scoreboard, Competition and Zen modes and speed and level difficulty settings. There are four separate PixPop games, each priced at $1, with artwork, dogs, extreme sports and “around the world” as settings. Bighorn Mountain Word Challenge is a $2 word game in which you build words based on letters; words are scored on the value of the letters. The game features a mountain theme. You can shuffle letters for bigger scores; playing 10 words completes the game. Jewel Quest Deluxe is a new game from I-Play. It’s a match three puzzle game with a Battle mode, 36 levels and storyline as you guide Rupert through India in search of jewels. It supports Facebook Connect, so you can post your game achievements on your Wall. It costs $3. FaceFighter, now on sale for $1, lets you take a picture of a friend (or foe) and fight them. You can use other people pets, cartoon characters, anyone you want. The game was designed by the creator of the Ready-2-Rumble boxing game franchise. A turn-based strategy game similar to Risk, Aevum Obscurum costs $5 (a light version is also available for free). The game puts you in charge of a budding empire vying for dominance on the European continent. Six scenarios are included ranging from ancient to medieval Europe. Toy Kite Software has released iSamurai Lite: Two-Player Sword Fight, a free version of their Wi-Fi sword fighting game for the iPhone and iPod touch. You battle another player in real life, pretending your devices are swords, slashing and blocking to attack and defend. TiltnTwist has released Snowboarding TNT for $2. It’s a snowboarding game which requires you to tilt and twist your iPhone or iPod touch to control your snowboard on the ski slope, dodging obstacles along the way. You can perform stunts, slice through course games, and do more than 30 different airborne tricks. Knights Onrush, Chillingo’s take on the tower defense genre, is now available in a free version. The game features endless siege mode, three enemy types, no high scores and automatic save/load. The full version, which features many more capabilities, is currently on sale for $3. You have to collect all the plasma cores and step through or avoid all the obstacles by manipulating gravity in this physics-based maze game. Gears of Gravity costs $1, and comes with 48 levels, three difficulty settings and accelerometer touch-based controls. Mobirate has released TriColor, a match-three game in which you build straight lines of same-colored blocks, by rotating and dropping colored figures. The game features bonuses which are given for matching more than one colored line or chain of lines. Quadion Technologies’ $1 NineGaps is a Sudoku-style puzzle game featuring a clever twist - operations like addition, subtraction, multiplication and division. It has three difficulty levels and unlimited puzzles.